Our homes offer the luxuries you want and the conveniences you expect. 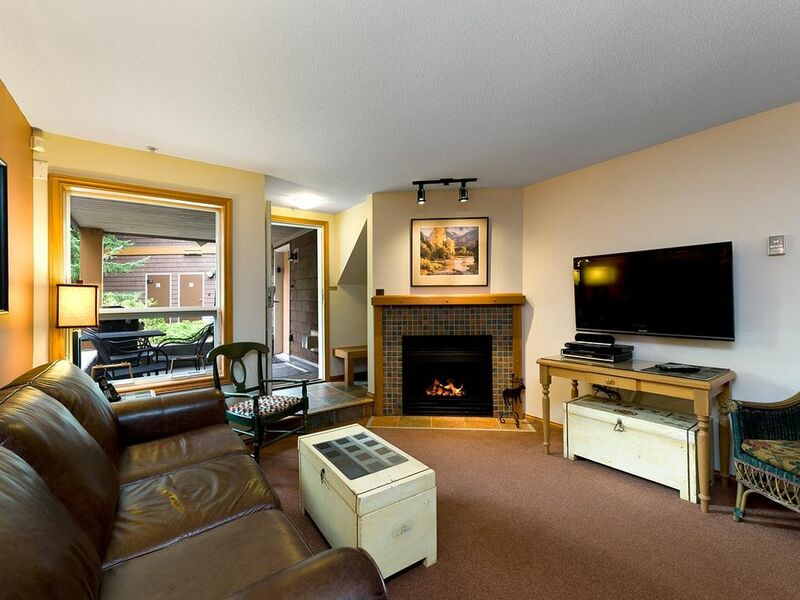 They are exceptionally clean, well maintained and fully equipped with Kitchen, Laundry, Internet, Private Hot Tub, Pool, fire place, free parking and a fantastic location in Whistler Village. We have over 2300 guest reviews and a 4.5 star average rating so give us a call toll free at for help planning your next in Whistler Vacation. Relax in your own private hot tub located on the more secluded side of the building. The front porch has a BBQ and mountain views. . We hope that you enjoy all of the comforts and amenities of this fully equipped vacation home at Glaciers Reach. Our guests appreciate the convenience of staying across from the Whistler Market Place which boasts; liquor and grocery stores, Starbucks, restaurants and several shops. All of our homes at Glaciers Reach are a ten minute walk or a free shuttle ride to the base of Whistler and Blackcomb mountains. Everything that Whistler Village offers is at your door step, along the picturesque, cobble-stoned village stroll. Some of the recent upgrades to this two bedroom two bathroom townhome include; mattresses and duvets. Other features include a BBQ, 2 LCD TVs, Stereo, gas fire place, heated year round pool, shared sauna, free underground parking and high speed internet with Wi-Fi. This vacation home sleeps a maximum of six guests but four is recommended. The bedding consists of; a queen bed, two twins that can be joined to make a king upon request and a queen sofa bed. All of our Whistler vacation rentals are professionally managed, well maintained and exceptionally clean. Fantastic location is across street minutes away from grocery, liquor stores, Tim Hortons and McDonalds. Bus stop to lift the cross street. Whistler brewing company just up the street and easy to get to with excellent food and beer. Communal pool and hot tub afforded casual meeting with other guests from around the country. Hot tub and pool serviced daily. Underground parking save time and money and easy access to vehicle. Washer and dryer big advantage and time saver used to clean and dry the days damp ski clothes. This was our secon year at Glaciers Reach, when we considered all factors this property was the best overall value. The condo was very clean. The location was very good. Right across the street from the free shuttle stop to the ski lifts. The grocery market was also right across the street. Having a private hot tub was great as the community tub was always full. My thanks to All Season Vacation Rentals. Our apartment (#59) was excellent - fully equipped kitchen, comfortable beds, great private hot tub, washer/dryer, plenty of linen and garbage bags for a week long stay (a sharp contrast to our Vancouver AirBNB where there aren't even spare garbage bags). Apartment was very clean on arrival, location very close walk to marketplace (supermarket, liquor store, medical facilities and other shops) and across the road from Whistler free bus shuttle. Great location and condo for a family of 4. We enjoyed the hot tub! The rental property is well equipped with a great location and fantastic value for money. well furnished and decorated. the kitchen equipments didn&#x2019;t miss a thing, even a blender was there and the host made sure there is a package of coffee there for the first morning, before we get out to buy food at the marketplace cross the street. hot tup was so relaxing after our 5 whole days seminar. we highly recommend this units and we will choose it again, when ever we get a chance to come back :-). special thanks to trevor who was always reachable trough email, for any questions we had.